Invisible as she was (and still is), it had been impossible for her to use the bank to transfer money to her family in Bulgaria. Anna Georgieva – not really her name, but her son (who we’ll call Ivan) didn’t want her to use it for the story – would be in downtown Athens once a month, at Ayiou Konstantinou number 36, Omonia, to send money to Bulgaria – by bus. The moment when she handed the driver an envelope with her mother’s name on it (among many similar envelopes from other women) symbolised a certain victory, a goal that had been fulfilled. Anna Georgieva can recall at least 168 such moments (14 years) of successful transactions, which were necessary so that Ivan, her only son back in Sofia, could become the promising lawyer he is today. Even fewer, though, were the moments that she actually saw him becoming one. While the majority of migrant women in Greece are employed in households (57.2% according to a 2011 survey)1, even those from the geographically and culturally related countries of the Balkans and Eastern Europe are not a compact, homogeneous group. When Poland, Bulgaria, and Romania joined the EU, this created new opportunities for domestic workers to live and work in Greece. However, cases like Anna’s remain; she is employed in the home of retired doctors who do not pay for her compulsory insurance, therefore she remains anchored in the traditional context of informal work. The absence of a sense of community among migrants from the Balkans and Eastern Europe is not only caused by differences in mobility rights granted by their EU status, but also by their diverse backgrounds and needs: for example, Albanian domestic workers generally came to Greece with their families, with plans to settle permanently, while Ukrainian immigrants, according to relevant studies, are typically widowed or divorced. Their differences are, of course, only one side of the coin. The other is the fact that these women are unable to even meet. Although Anna isn’t in a situation where she is caring for an infirm elderly person and can’t leave the home, she has worked for years without even one day off. Maria Louka from Ukraine, on the other hand, cares for an elderly, bed-ridden woman who is fully dependent on her, in a house very close to where Anna works. The two women have never met. The lack of days off not only violates labour laws, but is also to blame for the constantly over-burdened psychological state of domestic workers. During our conversation, Maria very often starts crying. It is also the reason why these migrant women are unable to unionise and demand legal working conditions. “It’s very difficult for them to organise when they have no day off, or if they can only leave on Sunday. They are fearful of people, they do not know society well, they rarely participate in open discussions. These women cannot read and write in Greek, they are ashamed, have little confidence in themselves and do not want to go alone to register with the tax office. So here we have a need for the Greek women who work in the industry to also join the union, to cooperate, and to demand the certification and recognition of their profession”, states Kostadinka Kuneva, European member of Parliament. Kuneva, who worked as a cleaner in Greece, served as secretary of the Greek Trade Union of Cleaners and Housekeepers. In 2008, because of her union activities, she was violently attacked with sulfuric acid (vitriol), causing permanent damage to her vision and vocal cords. Stuck in the homes of the cities or the isolated provinces of Greece, aiming to spend as little as possible from the wages they earn so they can send the rest back home, these migrants have a dual role as workers and heads of their families. Only, neither of the two is exactly right: their work is not legal, they don’t have the freedom to negotiate their terms, and they are basically alone – for them, their families exist on Skype. “I eventually found a solution with the water heater; when she was asleep, I’d secretly turn it on. But one night I forgot to turn it off. When the boss saw it in the morning all hell broke loose”, Anna, 49, tells about difficult employers, absurd or even offensive demands that go against the most basic human rights, from filthy apartments to personal attacks on the (un)importance of her country’s history. “I’ve worked here 14 years, and I haven’t gotten a single stamp [for social security/insurance]. When I was working in Kypseli, when we were not in the European Union yet, [the government] started a process for papers. But I was a live-in domestic worker and the boss had to give you a paper stating that you live at their address. Whenever you asked them about papers no one wanted to give you anything and of course to pay IKA [social security/insurance]. So I was left without it. It was terrible at first. Before we joined the EU, the police were after us. They’d board the buses, trolleys, and trains, or downtown in Omonia, where they’d stop the trucks which we’d use to transport stuff and transfer money. And now that we are in the EU I still can’t send money from the bank because I do not have a work permit. You must have an AMKA number [social security number], an AFM [tax number]. In order to get an AMKA number I have to have a home, or my employer has to give me some paper, I don’t even remember what, I’ve stopped asking”. The most Anna’s earned in Greece was 750 Euros per month. “Each September, I needed a lot to get my son books, shoes, and clothes. And then when he went to university, again I needed a lot of money – he had to rent an apartment in Sofia. Anyway, I didn’t keep any money for myself, I would send all of it home”, she says. MEP Kuneva, once a migrant and a cleaner herself, knows that this is not a job that allows you to save anything: “These women were sending all their money home and nothing was left for them. Neither for their own health insurance nor for their retirement. The ones who even managed to buy an apartment somewhere were very few. It’s not the kind of job where you’ll make so much that you’ll be relieved, that you’ll have an easier life. You can only compare it to difficult times, when shiploads of young people would leave Greece only to return after many years”. Ivan, however, thanks to his mother’s efforts and his own diligence, became a top student in law school. Recently he joined his country’s labour market and he is already earning a salary larger than Anna’s. She tells me, with noticeable joy, that from now on she only has to work to support herself. Having earned some [social security] stamps from a previous factory job, she’s able to get a minimum pension from her country (about 80 Euros per month). If the retired Greek doctors that employ her decide that they no longer need her, she will return to her village. However, the reality that she has already experienced in Greece no longer fits into her old life in Bulgaria. “Now you’re a stranger. Because I haven’t been back in years, I don’t know my old friends anymore, I don’t recognise their children… Others have passed away. I have a friend, I’ve known her since we were kids. But when I visit her, she talks about what she’s cooked and so on. That doesn’t interest me. For the same reason I can’t talk to my sister. All she thinks about is what she’s going to cook that day. I’m bored by this. OK, maybe I’m to blame. Because I’ve changed, I realise that. I’m not the way I was. I’ve become a grump”. The longest time between Anna’s visits to Bulgaria was two years, between 2005 and 2007. When she got off the bus and saw Ivan, 15 years old, “a ton of bricks fell on me” she says characteristically. “I’ve never experienced these feelings before. Ivan had changed very much and I thought maybe the time has come when you no longer recognise your own child. Weird feeling. I remember in the beginning when I had first left, how much he had cried. ‘Mommy don’t leave, don’t leave me, I don’t want money’. Now things have changed. We’re distanced from our children. They’ve managed to live on their own. I only think about the years when he was little and he needed me and I wasn’t there. We love each other but I don’t think we’ll get used to each other again”. 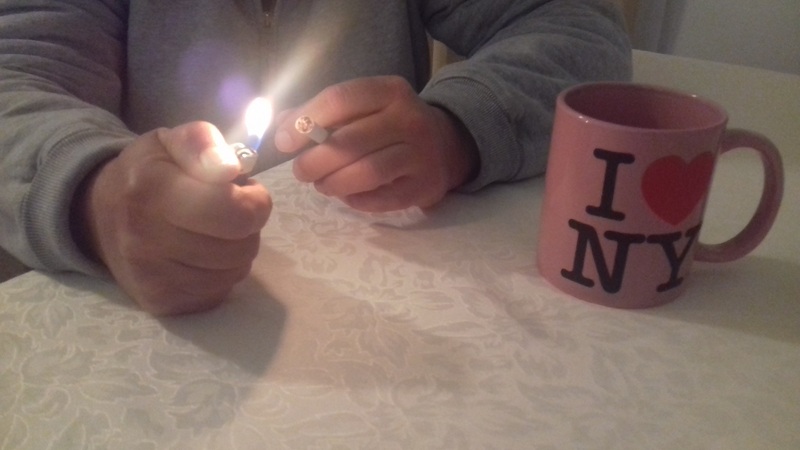 “Do you regret it?”, I ask her. “I came as a tourist, I had a two-month visa. I came with the bus from Lviv. It took 36 hours. I had to meet a friend of mine. I didn’t have a phone. I asked the driver to call her. She managed to meet me in the evening. It had been nine years since my husband died. My children are 12 years apart. The older son was married, the younger son had finished high school and was going to university to become a gym teacher. I didn’t have any money. I had to pay”. Maria came to Greece on November 11, 2002. She was 51 and already a grandmother. She had worked for 34 years in a hospital as a cook, 17 as the head cook. But the time came when the money just wasn’t enough and she was the only one in the family who could leave. At first she worked in Kesariani, caring for an elderly woman, however she wasn’t yet able to understand Greek well. “But the old woman had lived in America for 40 years. And she told me that when she first went to America she didn’t know the language either. She asked and slowly learned. And that’s how I got a notebook. I started asking about everything. I asked about everything I saw. In the evenings, I would sit and study. It’s still difficult”. In her 16 years of living in Greece, Maria has not only learned the language. 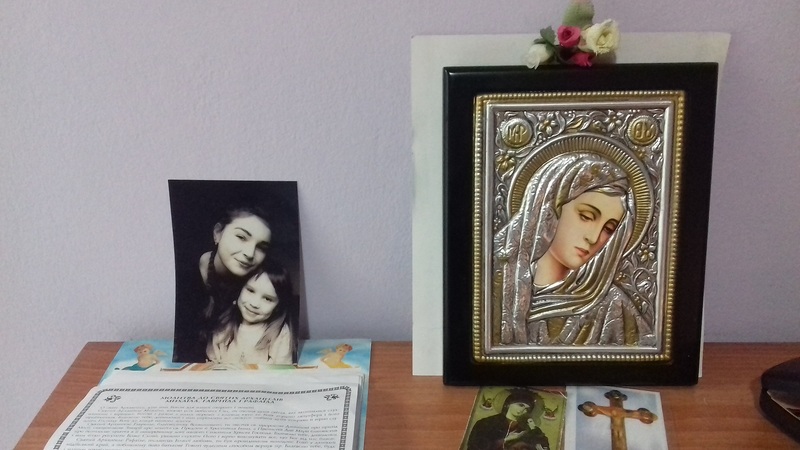 The granddaughter of a woman Maria cared for about seven years says that, apart from her own family, Maria is the only other person in the world that always remembers her birthday and the birthdays of all the people in their family. Although Maria has been living away from her own family for years in order to support them, she’s been living with other families which she also supports and, inevitably, sometimes loves. “I liked it a lot there. It was like being home. They asked me how we celebrate Christmas in Ukraine”. Her eyes fill with tears as she describes how important it is for people to simply show an interest. Like most women who care for the elderly in Greece, Maria stayed with each one of them until the end. “I would help them up, I would give them baths. Nobody helped. And then I’d do the laundry and ironing”. Somewhere in between her household chores, she would also hear news of her own parents. “Before I left, everyone was still living. I would call them all the time. I always knew what they were doing. But I couldn’t go there. Well, I could go, but I couldn’t return to Greece. The longest I was away was three years and eight months. And one day during that time, it was July 23rd… at 7pm, I took the elderly woman out for a walk and I called home from my mobile phone. “Your mother just died”, they told me. Like Anna, Maria has also seen her children become independent and live on their own and now says she’ll work only for herself. I ask what she’d do if she could turn back time and she says, categorically, that she would never have left her country. “Time has frozen. 16 years. They’ve learned to be on their own. The grandchildren have grown up without me. I miss everything”. Anna Georgieva and Maria Louka are in many cases the invisible side of contemporary Greek families. In her study of domestic workers from the Balkans and Eastern Europe, researcher Katerina Vasilikou notes that for migrant women “the family becomes something to fight for, a matter of continuous effort, more like a process than a stable structure”. The international family – a family in which the bonds don’t cease to exist just because its members are separated by great distances – depends to a large extent on constantly maintaining communication. For most of their time in Greece, Anna and Maria did not have access to advanced communication technology with their families. On Sundays they called their families from pay phones: Maria recalls that 20 minutes cost her 3 Euros, the price of the phone card. Anna bought a laptop from Bulgaria. 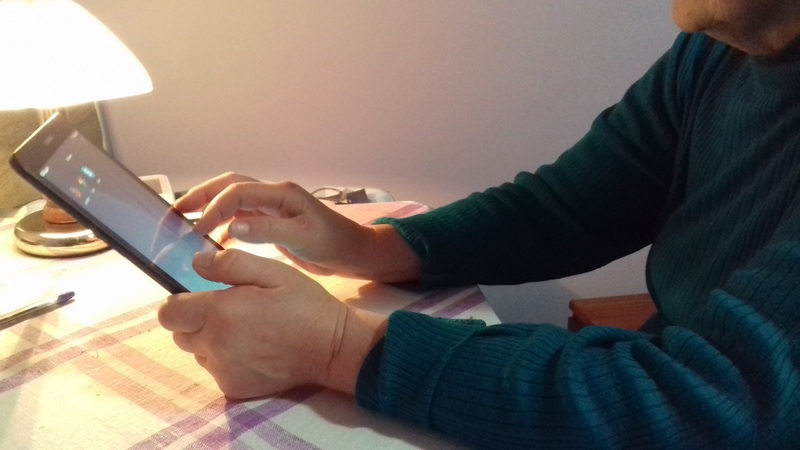 After trying for three years to connect to the neighbour’s wifi from her mobile phone, Maria recently got a tablet and at the house where she works they provide Internet. Now, at least, both women are less surprised by how quickly their families back home are growing and changing. It seems that women are the main reason international families remain united, even if they are the ones who leave. Kostadinka Kuneva offers an explanation: “As life has shown and as seen by most people across Europe over the past 30 years, women are the ones who are more adaptable and flexible, and they more readily decide to leave so that they can seek work elsewhere to support their family. I’ve had this view, that as women we learn to offer our body and energy and work for others, and in this way, I think, we’re working on our selfishness. This turns into love, then devotion, and so a mother feels a great responsibility to support her children when she sees that other family members are unable to do so for one reason or another. A woman can’t wait when she sees that her child has nothing to eat. I remember my aunt felt very bad when her son asked for a cookie, not a chocolate cookie but merely a biscuit, which costs very little – a few coins, but she didn’t even have a few coins in her wallet. What should she do about food, how could she afford to educate her child? So she had to leave. And she always said: ‘I left for a cookie’”. The regulation of the occupation of domestic workers, let alone the existence of a certification framework, would not only change the lives of women living in many cases as prisoners, but also benefit their employers, the very families who entrust the care of their loved ones to a person they know very little about. 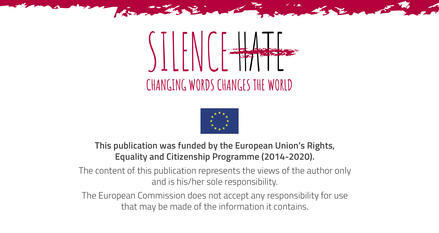 To some extent, it would positively affect the lives of the children of migrants, as “it’s one thing to have to suddenly leave for a job that’s like a prison, to endure the lack of respect, for your family to not even know if you’re alive, how you are, for them to take your papers and not give them back… and it’s another thing for them to know that you went to a research centre, or to a university or a company and you have an address and phone and you can always be in contact”, adds Kuneva. For the rest, it is difficult to offer answers. How do you compensate for the loss of a parent who is not dead and how do you manage the guilt that you likely feel because the loss is your fault, or for your benefit? This can only be answered by the global generation who grew up without their mothers.